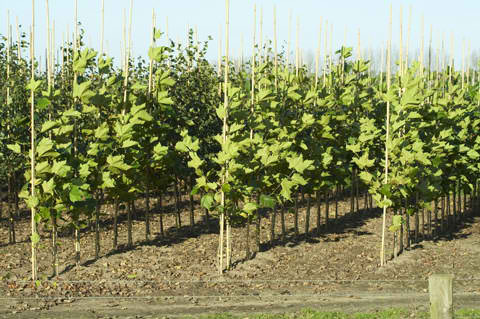 There are a wide variety of deciduous and coniferous trees to chose from at the Turfsavers Tree Farm nursery. The trees have been hand selected and raised by Brian to ensure a strong healthy end product. Turfsavers Tree Farm has the capability to transplant trees with a trunk diameter up to 6" with state of the art equipment. Their expertise in tree relocation will provide a quality and eco-friendly tree planting experience. We can move your new Ornamental Trees, Shade Trees, or Evergreen Trees safely, efficiently, and economically. From start to finish, Turfsavers Tree Farm can plant your new tree for you. Rest assured that the tree will be properly planted, and have the best chance of living in your yard for years to come. We can also ball and burlap your new tree and you can plant it yourself. Instructions on maintenance and self planting can be reviewed on our Tree Maintenance Page!